This summer's Air Tattoo will feature a display from the Swiss Air Force! The nation will be sending an F/A-18C Hornet to fly an energetic display of this Cold War-era fighter for Air Tattoo crowds. Three squadrons in the Swiss Air Force operate the twin-engined, multi-role Hornet. 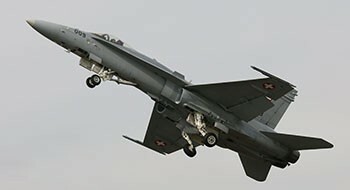 The aircraft's primary role in Switzerland is air policing. The Swiss are strong supporters of the Air Tattoo, last year sending both the Hornet and PC-7 Display Team to celebrate the Royal Air Force's 100th anniversary. The Swiss Hornet joins the Spanish Navy's Harrier 'jump jet' as the second confirmed aircraft for the 2019 Air Tattoo, held on 19-21 July at RAF Fairford.